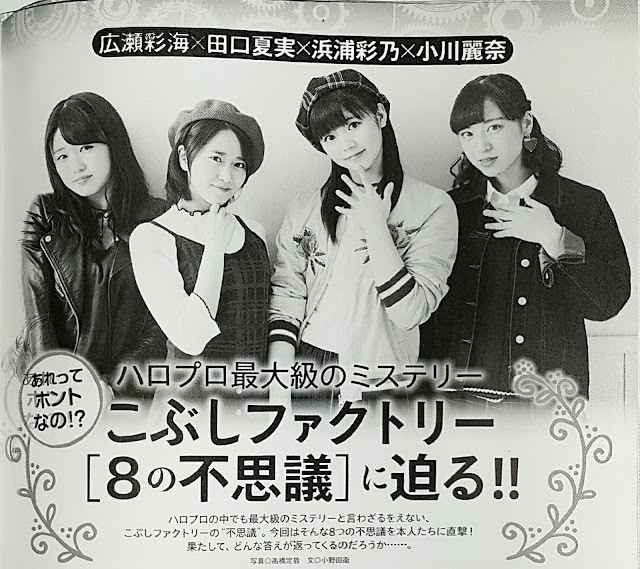 We dig into Kobushi Factory's '8 mysteries'!! One can't help but say that Kobushi Factory's mysteries are some of H!P's biggest mysteries. This time around, we attack them directly about eight of these mysteries. Why are all of you always so loud!? Hamaura: But honestly, what's the real reason? When you're on tour or doing promotional activities, you're always together with the members, aren't you? Don't you run out of things to talk about? Taguchi: Now that you mention it, what do we normally talk about......? Hamaura: We generally start by reporting what happened during the day. Isn't that what little kids do at home, reporting to their mothers what happened during the day? Hamaura: Well there is that. (laughs) Which reminds me, we often talk of family as well. Actually, we get to hear lots of stories, like why someone got into a fight with their mum in the morning. Those are pretty funny. Taguchi: Family stories are a staple. 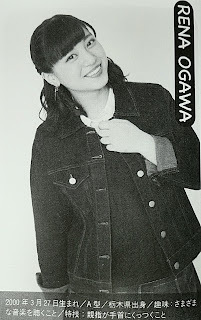 Hamaura: For example, Ogawa Rena-chan's mother has the same personality as Ogawa Rena-chan. It must get pretty crazy in the Ogawa household! Taguchi: It's weird to use say things like 'throw' when referring to your parents. (bitter laugh) But Rena definitely loves her mother. That's the reason why they often clash. She'll say things like 'I really hate you! You don't understand anything!' Immediately after that, with a wheedling voice, she'll call her, 'Mama~? I'm coming back home now, ok~♥'. Hamaura: The funny thing is that when we talk about our families, we'll act it out. Act it out? In what sense? Hamaura: Everyone gets a role, like 'father', 'mother', 'myself'. We have fun acting out not just the Ogawa household, but the funny Taguchi household as well. There are rumours that Hamachan is the boss-in-the-shadows. Is that true!? Hirose: It's true! She's guilty! 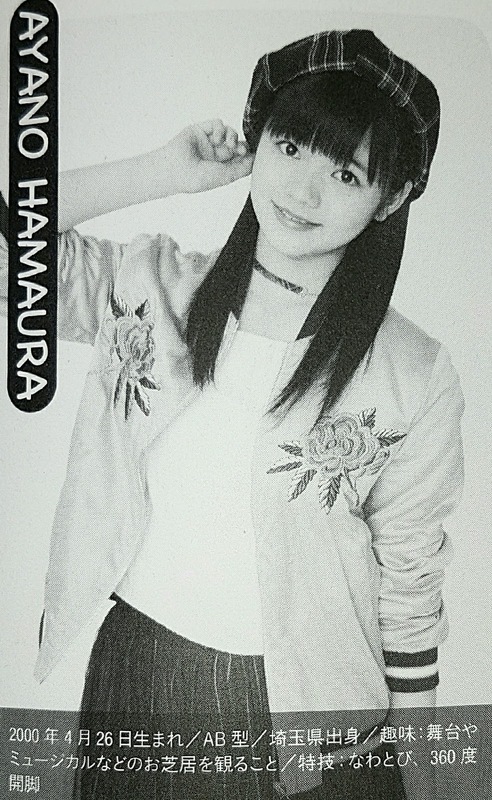 For the fans who have been watching her since her H!P Kenshuusei days, it's hard to imagine the sight of Hamaura-san mercilessly taking control. Hamaura: Is that so? Near the end of my tenure as a Kenshuusei, I was relatively quite in charge. And it was simply due to me being more senior in years. Taguchi: That's true, they might have a slightly different image of her if they've watched her since she was in primary school. Since she was really small. But we've grown. Hamaura: They generally know what I'll nag about. It's when they just up and change the choreography of their own accord, doing the moves differently from what our sensei taught us! The nuance of the dance is forced to change because they insert their own adjustments to the moves? Taguchi: Nothing so presumptuous. For example, as Kenshuusei, we got to dance 'Piriri to Yukou!' on the same stage as Berryz Kobo-san. At the time, even though the correct move was to spin our arms right, everyone except me spun their arms left. I'd even reminded them before the rehearsals. I'd told them to spin their arms right at that point. That's when I got angry. Taguchi: When it comes to performing, Hamachan is the most serious. Even when she says that we've got to stir things up, she always wraps things up perfectly. On the other hand, Fujii Rio-chan and I will check whether we're doing the right thing by looking at Hamachan. Hamaura: No, it's the truth. She promised me in the past. That once we became Kobushi Factory, she would stop that. So from then onwards, I stopped teaching her. How did Kobushi develop your singing!? Your extremely intense, low vocals are a major weapon of the group. But that way of singing wasn't something that was acquired during your Kenshuusei era, was it? Hamaura: That's true. I think that it came from us practising individually. Taguchi: That's wrong! Please hear me out! It's true that Kobushi Factory have a lot of cool songs. So for me, I really work hard at putting in a lot of spirit during the recordings! Videos of the recordings are uploaded to YouTube, so please watch those! Ogawa: There's also the matter of vocal quality. Some things can't be helped! Hirose: Taguchi Natsumi-chan, Ogawa Rena-chan, and also Fujii Rio-chan...... These three possess cute voices. When all of us are shouting, it's difficult on the ears. It sounds like all of us are growling. (laughs) Having sweet voices added in the midst of that adds some spice. I like the balance of our voices. Ogawa: Well, that's our leader for you! Wrapping things up nicely! Ogawa Rena isn't acting out a character, she's naturally an airhead!? Hamaura: She's not an airhead though, is she? 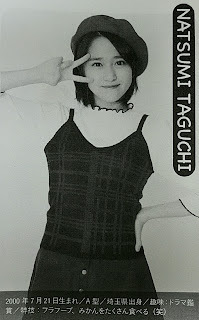 Taguchi: No, she isn't. She says that she is, but I'd expect that someone who actually is an airhead wouldn't be aware of it. It's probably since Rena is an idiot, which makes people say that she's an airhead, and it stuck in her mind. Hirose: In the first place, do you even know what 'airhead' means? Ogawa: It's being clumsy, right? Doing things like falling over. Hirose: Hmm~ That's not exactly wrong...... I'd give you 70 marks. By the way, do you study in the dressing room? Hirose: Depends on the person. I don't. Since I can't concentrate if I'm not at home. 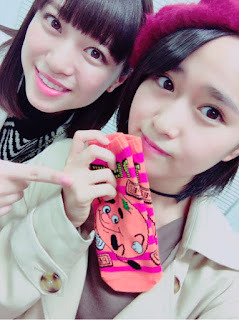 Taguchi: Since Inoue Rei-chan's in her 3rd year of middle school, she's recently been studying in the dressing room and while we're on the move, preparing for exams. Ogawa: I also feel like Nomura Minami-chan often reads her textbooks as well~. Taguchi: It seems that she likes Japanese. The other day, she was reading a textbook aloud in the corridor. I was surprised. There actually is a member that's more stupid than Ogawa Rena? Hirose: (*After an awkward moment of silence*)...... N, no! There isn't! Taguchi: Take some time to think about it! As if anyone could be more of an idiot than Rena! May I ask why your eyes are all darting about? Furthermore, why are you casting subtle glances at Hamaura-san? Ogawa: ......We actually have an official YouTube programme, 'Haro!Sute', uploaded weekly on Wednesdays at 9 p.m. We did a quiz on the show. Kobushi Factory and Tsubaki Factory members were mixed together. We were testing sideways thinking. Taguchi: Not 'sideways thinking', it was 'lateral thinking'! Every single thing you say is so idiotic! Ogawa: Hirose Ayaka-chan scored the highest on that quiz. How many points was it again? Hirose: About 18 points out of 20. Ogawa: Well, that's just what everyone would expect. While I just got 4 points! But I think that was within everyone's expectations as well. The fans love you for being an idiot, so in a sense, you were living up to expectations. Hirose: When Ogawa Rena-chan's marks were announced, we still didn't know Hamaura Ayano-chan's score. Hamachan was having a good laugh at her expense. Like 'Ahaha! What an idiot~!' But then the cat was let out of the bag: she herself had scored the very same 4 points. (laughs) She froze up in an instant. Taguchi: That's true. But if some numerical questions had come out, you'd have gotten better marks, right? Hamaura: Well, maths is my weakest subject though. (laughs bitterly) On the other hand, if I had to pick the subject I'm strongest at... Home economics? Taguchi: See, the questions were the problem! There should have been several question on home economics among those 20 questions! Taguchi-san, why are you covering up for Hamaura-san so much? What's your honest opinion of Tsubaki Factory? In February next year, Tsubaki Factory will finally be making their major debut. It might mark the beginning of a legendary long-lasting rivalry, 'the 2nd BeriKyuu'. Hirose: For me, I've had a long association with Tsubaki Factory's subleader Ogata Risa-chan, from way back. When I heard that they would be making their major debut, I was honestly happy. Risa-chan and I love Hello! Project, and we took the Morning Musume。 auditions together. 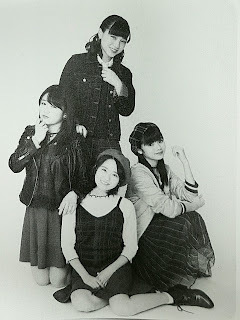 We used to talk a lot about joining H!P someday. Ogawa: I'd like to work hard in order to be better known, so that people will be able to match our faces to our names. Taguchi: The increase in Tsubaki Factory's numbers has bumped up their intensity, hasn't it? When the day comes when they bring out even more of their 'mature charm', I think things'll get crazy. We can't fight them on that front. Putting it simply, being the new group, they'll draw all the attention, so if we don't turn up the intensity, we'll lose. 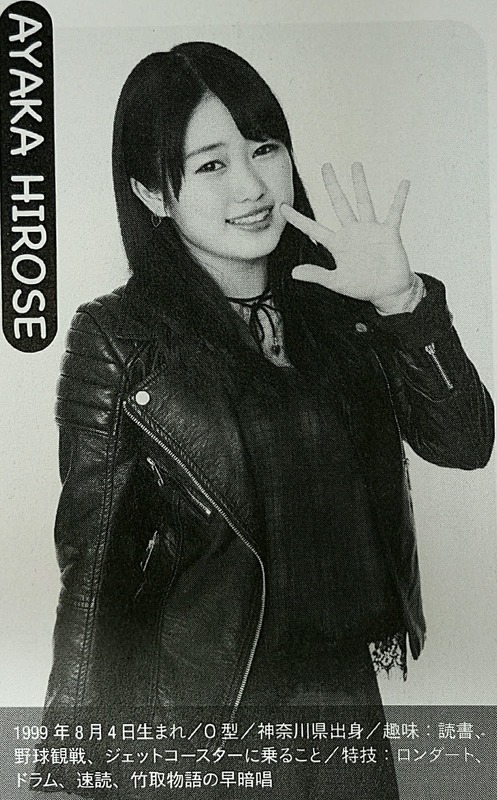 Why are the 8 members of Kobushi so cute!? Hirose: Eh~!? I'm not cute though~! Taguchi: Well, shouldn't you ask Ogawa-san, who's definitely confident about her cuteness? Ogawa: What I often feel is that the Kobushi-gumi (the general term for their fans) are really nice. Even on days when my face is slightly off from peak form, they'll praise my cuteness. A person becomes cute if they keep on being told that they're cute, don't they? With that having actually happened, aren't I really cute? Ogawa: So I think that a big part of our cuteness comes from the power of the words of the Kobushi-gumi. Hamaura: But it's true. The reason we're here truly is because of the fans. We'll do our best, with everything we've got, in order not to disgrace the Kobushi-gumi! Finally, how about sharing some secret stories about the members who aren't here? Taguchi: Previously, I'd gotten into a stormy mood in the middle of a shooting...... I didn't want to meet the others, and I was doing some weeding at a place that was some ways away. And then, from a car that was parked nearby, the window opened to reveal someone in sunglasses making smug faces, funny faces. It was Fujii Rio-chan. She called out to me, acting like some sort of hot guy, going 'It's fine, how about you come back?' The sight of her was just so silly that I completely forgot about my ill mood. Rio-chan's kindness has often been a lifesaver to me. Ogawa: Nomura Minami-chan's handwriting is pretty, and she's well known for her smarts, even amongst the fans. But recently, she's been standing out by making the occasional strange remark. The idiot role is well covered by me, so I'd like to warn her to not step into my territory! Hamaura: It seems that Inoue Rei-chan has cured her shyness. It's good, but then the opposite problem has cropped up: she makes too much noise. (laughs) When we're on the move, she'll start singing in a loud voice when everyone's sleeping. It's such a nuisance! And recently she's been pulling funny faces in the middle of MCs. To all you fans, keep an eye out for that facet of ReiRei as well. Renako, poor girl.. Must be hard to act (or real) as a "Baka-Onna"